This large, round general purpose case is designed to handle national and international freight shipments for large Orbital Express truss displays as well as a variety of other large exhibits. 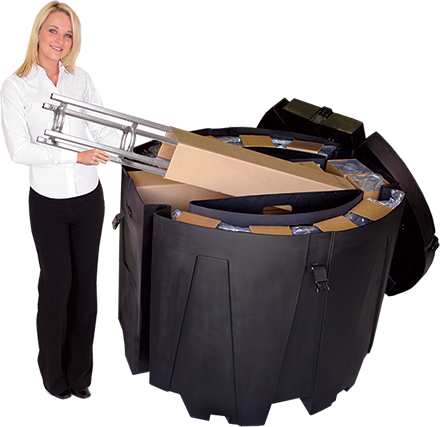 The OCT is stackable and can be moved using the built-in casters or with a forklift. 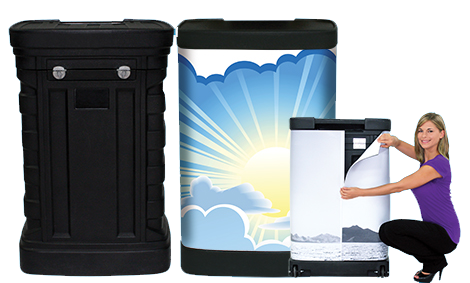 Offering the maximum protection for your exhibit materials, the OCT is a heavy-duty but eco-friendly choice that is made in the USA. 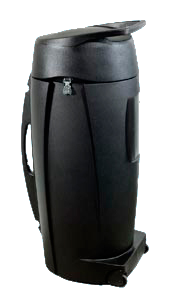 This black LLDPE polyethlene transit case is the perfect, premium protective shipping case for monitor screens up to 47″ large. 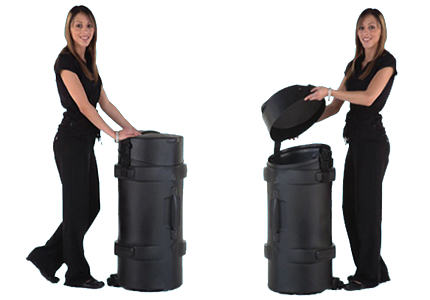 The OCM includes 3″ casters with rubber wheels for ease and movability during transit. 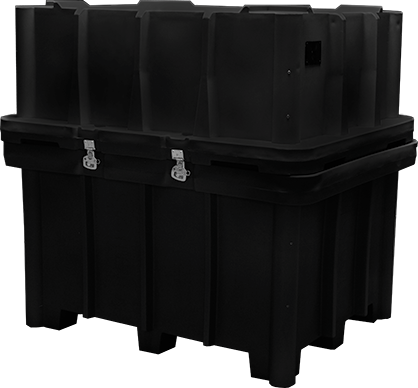 Made in the USA, the LCRATE is a stackable, durable roto-molded freight case designed to protect large exhibits and 8ft x 3ft panels. NCRATE is a large, general purpose roto-molded case designed to handle national and international freight shipments for large exhibits and up to 36 layers of 4 x 4 panels. 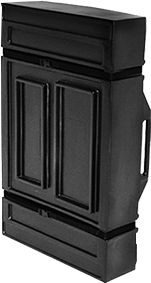 Made in the USA, the NCRATE is stackable, durable and secure, offering maximum protection for exhibit materials. Includes premium lockable latches. 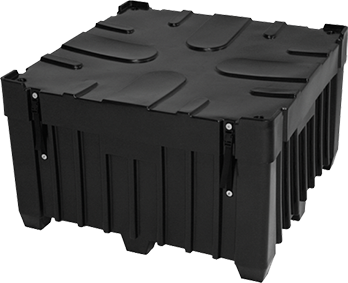 SCRATE is a large, general purpose roto-molded freight case for large exhibits and up to 24 layers of 4×4 panels. 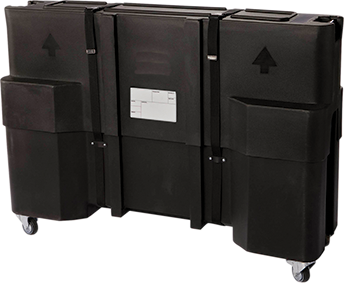 Made in the USA and designed to handle national and international freight shipping, the SCRATE is stackable and secure, offering the best protection for your exhibit materials. Also features premium lockable latches. 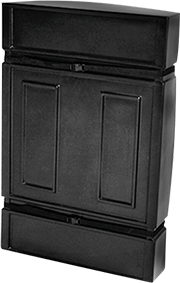 This black transit case is the perfect, premium protective freight shipping case for a variety of large exhibits.. Interlocking surface enables two cases to be transported together. Secure reinforced straps assure case will remain closed during transportation. A maximum case depth of 8″ allows up to eight flat panels per case. 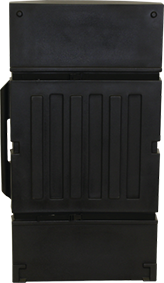 This molded stackable shipping crate is 18″ deep making it a perfect choice for a variety of products. The OCF2 can hold up to 18 layers of flat panels in a horizontal direction. A heavy-duty roller bearing is recessed in the bridge of the case. This large general purpose case is designed to handle national and international freight shipments. It offers maximum protection for your exhibit materials. The OCF is stackable and can be moved using the built-in casters or with a forklift. 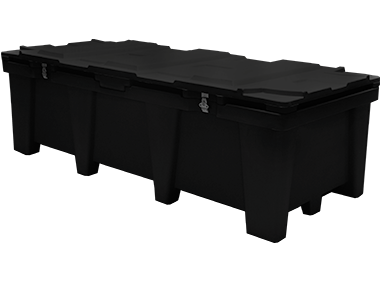 This shipping case is rotationally molded for lower weight, strength and durability. 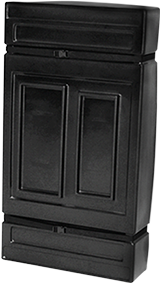 It is available with and without casters and can be expanded an additional 5″ to add any last minute items. Rotationally molded for strength and durability, Abex flat shipping cases offer light weight, outstanding durability and protection of valuable panels and components in transit and storage. 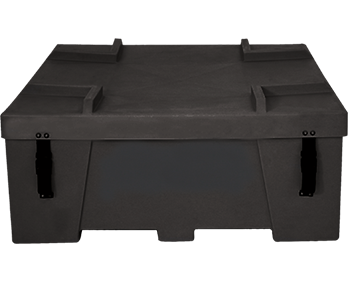 This rotomolded case is designed for lower weight to transport and store your invaluable panels and graphics with strength and mobility. while also providing the ease of mobility. This excellent case is designed to safely transport and store your invaluable graphics while also providing the ease of moving a wheeled case to it’s location. The interlocking surface of the OCHM enables two cases to be transported together. Up to eight flat panels can fit per case. 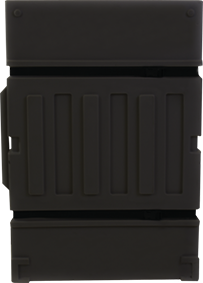 This case is made in the USA and is designed for maximum portability and protection during shipping. This heavy-duty shipping and storage case is ideal for modular exhibit systems such as Hybrid Pro Modular, Vector Frame Geometric and Linear Extrusion displays. Secure reinforced straps help to assure case will remain closed during transport. This versitale graphics accessory case is expandable from 7″ to 13″. Is is rotomolded for lighter weight and offerse very good protection and durability. 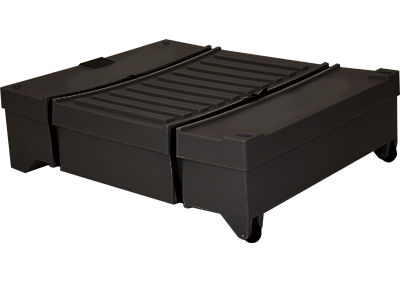 Our shipping cases are rotationally molded for lower weight, while still supply excellent strength and durability. Choose from a wide variety of available sizes. Strong, yet lightweight, the black roto-molded OCH case is ideal for Hero panel displays, Vector Frame light boxes and more. Secure reinforced straps help to assure case will remain closed during transportation. 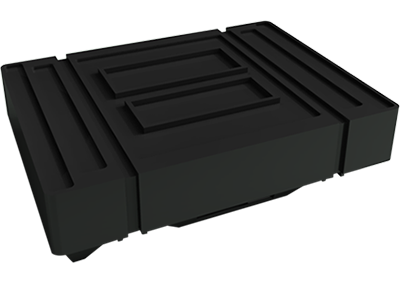 This hard molded black transit case is the perfect, premium protective shipping case for Hopup backwall displays – holding up to a 4×3 unit. 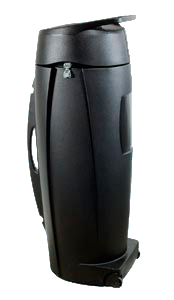 The OC-HOP has a built-in handle and wheels for easy transportation to and from exhibits. This roto-molded exhibit transit case is the perfect, premium protective shipping case for a variety of exhibits, displays, and more. The OCP2 has built-in recessed wheels to help protect during transit. It also features premium zinc plated steel locks to ensure display material is secure during transport. Add a professional finish to your display by converting the OCP2 case into a counter with a roll wrap for an exposed countertop or a pullover fabric stretch wrap for a completely covered exterior. 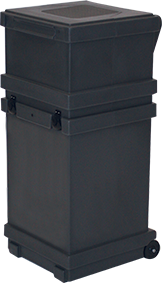 Height: Interior: 35" / Exterior: 40.5"
Width: Interior: 14" / Exterior: 18"
Depth: Interior: 22.5" / Exterior: 26"
Rotationally molded for strength and durability, Abex 4155 Case offers light weight, outstanding durability and protection of valuable panels and components while in transit or storage. Built to protect a variety of products, like the Formulate Master kits or rollable display graphics and several others, the OCS blow-molded display case features built-in wheels and easy-to-grip molded handles for portability and easy transport. OCS cases are built in the USA and backed by a one year warranty against manufacturing defects. 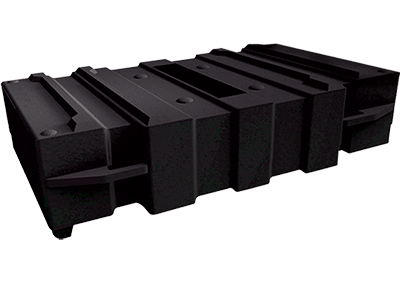 Rotationally molded for strength and durability, Abex 4106 Case offers light weight, outstanding durability and protection of valuable panels and components in transit. Made in the USA.